O and I also made a really easy and light Peach Smoothie on Saturday. I haven’t put peaches in my smoothies is quiet a while because the last time I did, it just tasted…well…bad. But I tried again, many months later and it tasted so good, so why not share. It is supper easy and only a 3 real ingredients! – 2-3 Cups of Spinach or your favorite greens! 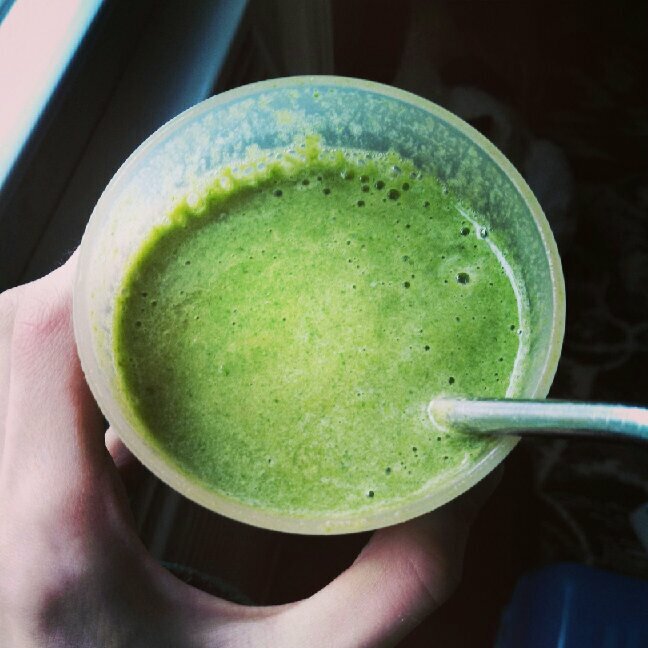 – In to the blender: water, peaches, protein, spinach. Then Blend, blend, blend! Sunday was spent eating Pumpkin Pancakes (with peanut vanilla sauce…so so so good!) for breakfast, then lots of cooking, cooking, cooking, picture taking, writing, and more relaxing. But now it is time to get back to grind. I am so looking forward to November though. We have a ton of days off for teacher’s convention, Thanksgiving, etc. It will be very much appreciated but also spent doing college applications. For now, I’ll just focus on making each week as good as possible! 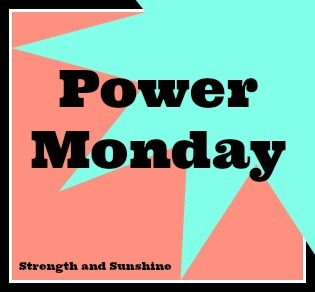 Power Monday time! My favorite body part/area of the body to workout is the core. It is so important to have a strong base and foundation. Having a strong core leads to good posture, balance, performing everyday tasks without injury, and increases your overall ability in exercise performance. I am one of those people who chooses to work my core everyday. I don’t believe in doing endless crunches, they have so little effect on core strength, and my goal is not to get a 6-pack. A 6-pack is not realistic for the majority of us, especially women, some of our bodies were just not built that way. Working the core doesn’t lead to “abs” anyway, it is only one component. As the old saying goes, “Abs are made in the Kitchen”. This is so true because to have “abs” show you need at have a low body fat percentage which can be dangerous for the everyday person to want to achieve. So my stance on “abs” is to focus on the whole core and strengthen it so you have a firm and stable base while eating a whole clean diet. I am looking for strength, not fitness competitor physique. Now my all time favorite move to strengthen the whole core, which also includes legs and arms, so basically the whole body, is the plank! Once you learn proper form they are so easy (and I think fun) to do just about anywhere. They are a great progress tracker move as well since you can easily see your strength increasing as you are able to hold the plank for longer and longer times. I haven’t checked in a few months but my top time for holding a traditional elbow plank is 8-minutes! Now that might seem like a crazy far off dream for most, but if you practice everyday or at least 3-4 days a week you can definitely get there in no time. As you work your way from a traditional plank to harder variations you will see that planks really are a full body workout and they are so fun, I promise! You may love to hate them, but you will still love them…just like Burpees! The Traditional Plank: You can either start by being on hands and toes (or knees) or go harder and go to elbows. Here you can also add leg lifts by raising you feet alternatively from the floor a few inches and holding. Same with the arms. The Side Plank: Here you want to be either on one hand or elbow turned to the side. Feet stacked one on top of the other. Thread The Needle: In a side plank, bring you arm up then thread it under your torso and twist. That’s one rep! Hip Dips: In a side plank, lower you hip to almost touching the floor and lift it back up. Keep you core tight! Side Plank Knee Tuck or Straight Leg Kick: Bring you lower leg, bend up to the chest and back. Or, I also like to bring the top leg our completely straight and back for a straight leg kick. Side Plank Cinch or Leg Raise: For the Cinch bring you top leg bent, knew pointing up and cinch it to you elbow for 1 rep. Or simply raise the top leg and lower for one rep.
Plank-Jacks: These are my favorites! In a Traditional Plank (hands or elbows) Simple jump your feet out wide and back together for one rep. These are great for adding into a Tabata or quick cardio/strength circuit! Knees to Elbows: In a Traditional Plank bring you knee to the same side’s elbow then back down. Alternate sides. Opposite Knee to Elbow: This is essentially the same as above although this time you are bringing your knee to the opposite elbow and back. Mountain Climbers: The ultimate Cardio Plank! As quickly as you can bring your knees up to you chest like you are climbing a mountain! Up-Down Planks: Start in a Traditional Elbow Plank and then bring use one arm, then the other to raise yourself to a hand plank, then bend one elbow and reverse the sequence to go back down to both elbows. Start with doing 10 using the right hand first, then 10 using the left hand first so your arms get worked the same! Exercise Ball Elbow Plank: These are my new favorite obsession! They are killer. You do a traditional elbow plank but have your elbows up on the ball! This takes massive core and arm strength, but most importantly stabilization and balance! Feet on the Ball Plank: Using the same concept as above, but easier, Place you toes on the exercise ball and hold your plank! Or you can do a side plank with you feet up in the ball! The Knee Tuck: With you feet on the ball, using your lower abs, tuck your knees into your chest, (arms and back both as straight as possible), hold for 2 seconds and bring them back out. That’s 1 rep! The Pike: This is the same concept as above, but now your legs are start as you bring your hips up into the air and back down for 1 rep! These are only a few of the endless variations of plank! I am constantly trying out new ones so my core can get conditioned with the full spectrum of awesomeness that the plank brings! Many of these variation are difficult so progress slowly as you increase strength. Start with the traditional types and move your self up. Keep track of how long or how many reps you can do of the variations and track your progress! Remember, have fun with it, rest when your body needs rest, and progress at your own speed and for you ability! It’s not about the 6-pack, it is about strength, stabilization, and balance! What is you favorite variation of plank? Ohmigosh, way too many ways to do planks! I so hate them right now…..
Just keep practicing them! Always switch up the variations and you won’t be bored and it will increase the “fun”! OMG, I totally need to try these plank variations!!! The plank jacks sound awesome (and also very difficult). Planks Jacks are an awesome addition for a killer workout! I just made that smoothie again today, it was awesome! Great set of plank workouts! I had no idea there was such a thing as quinoa flakes., quinoa is something I want to learn more about and start cooking with. By the way, I used to be such a reader too, and now I can’t even fix time for a magazine. I wish there were more hours in a day! It is only since I started blogging though that I don’t have the time 😛 Quinoa is so great and it is so easy to cook (especially flakes). Try it out, its an awesome protein source! I can only do side planks on one side because of my arm disability – but I love a good traditional plank or a knee to elbow plank! At least there are so many options you can modify to still build strength! Meh! Definitely not side planks. haha I like a regular ol’ plank. It actually feels good as a stretch. Side Planks are the bomb! You need strong obliques! I am a hater of the mountain climbers they still kill me – I do them three days a week at bootcamp though and refuse to give up! I recently conquered the side planks after a few months of on and off trying – glad I did really works. I love jacks also I do alternative leg side taps (don’t know the technical term) and I love them. Great post with some I’ve not tried before. Mountain climbers are awesome, keep fighting though! Haha! Personally I am not a fan of Jillian. So many awesome variations! Thanks for sharing. Eagerly awaiting your quinoa flakes recipe. I had a bowl of quinoa flakes this morning and it was my favorite thus far. I cooked it with a sliced banana and topped with chia seeds, hemp hearts and dried fruit. Perfect! I am totally on the cocoa powder and instant decaf coffee mix for flavors! The recipe will actually be up next week along with 2 others that I am still testing out!